Starting this April, WABA members in Maryland and D.C. are able to switch to wind power at a discount! After switching over WABA’s 2599 Ontario Road NW office to wind power with Clean Currents, the region’s leading independent and sustainably certified green energy provider, we are partnering with them to offer members the same discounted rate on wind power for your own homes. By providing a 12-month fixed rate, Clean Currents is offering WABA members a 10 percent discount from their posted rates for wind power. Starting in June, this discounted rate is approximately 5 percent lower than the average rates Pepco and BGE are charging for electricity generation and transmission. How does it work? In Maryland and D.C., if you pay your own utility bill (whether you own your home or rent), you have the power to choose your electricity supplier. So you can choose to put the money you already spend on your electricity bills toward Clean Currents and support wind power. How do you as a WABA member make the switch? It’s easy and takes just minutes, but you need to email us for the discount link at membership@waba.org. For specific questions, contact Clean Currents at (301) 754-0430 ext. 3 or email gogreen@cleancurrents.com. There is no installation or switching fees. It is the same dependable power to your home. You will continue to receive just one utility bill (from your same provider). Double-check that you are not with another third-party supplier (i.e. an energy provider other than Pepco or BGE). The discounted fixed rate for WABA members will save you approximately 5 percent on your electricity generation and transmission services starting in June. Why? In June, Pepco is raising its rates to 9.50 cents/KWh and BGE is raising its rates to 10.47 cents/KWh. 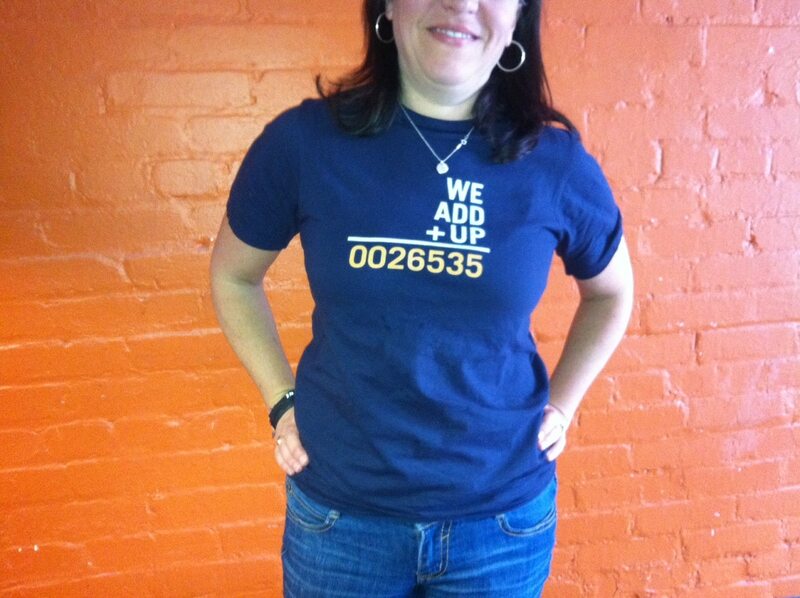 Additionally, throughout April, Clean Currents is giving “We Add Up” shirts (pictured) to each home that signs up for wind power. Each shirt has a unique number on it that counts for every person who is doing their part to support wind power production. To get counted, make the switch to wind power now! Once you sign up, pick up your shirt at the WABA office during office hours (Monday through Friday, 9 a.m. to 5 p.m.). If you have any questions about the benefit or other membership benefits, contact membership@waba.org or call (202) 518.0524 ext. 203. Topics: Uncategorized. Tags: member benefits, members, membership.